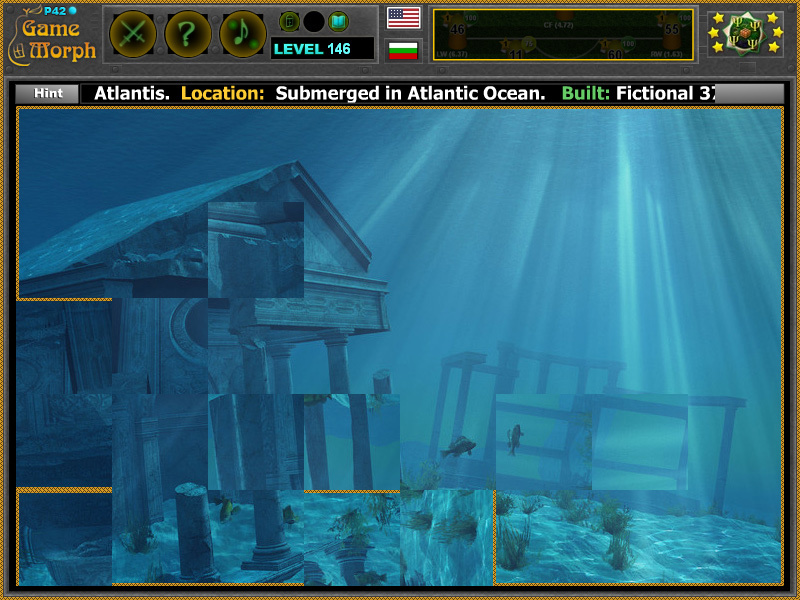 The lost Atlantis continent in a fun online archaeology learning game. 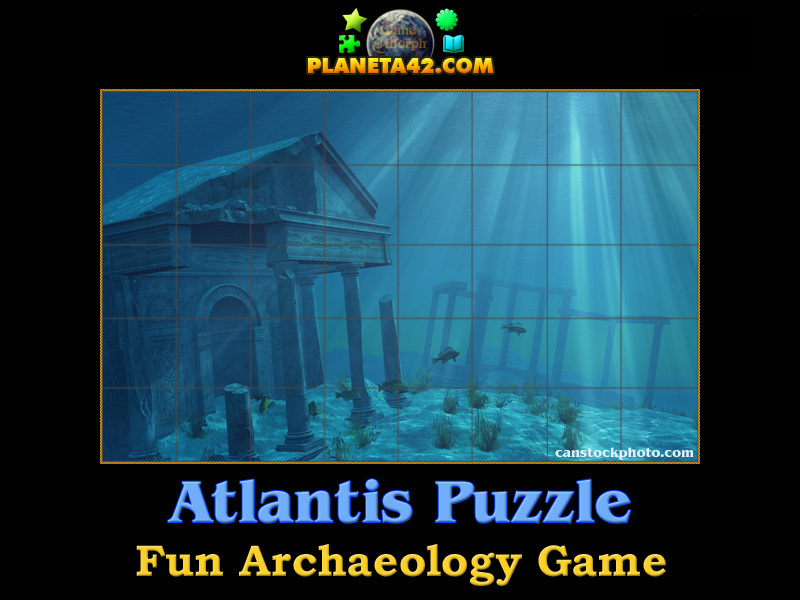 "Atlantis Puzzle" is a small knowledge level game to sort 40 piece puzzle with artistic picture of the lost Atlantis Continent. Interactive ancient world learning. Fun educational archaeology game, suitable for online lessons and interactive classes. Lost Atlantis Puzzle. Minute to win it game. Game code by Ogo Bob. Atlantis picture by canstockphoto.com. How to play Atlantis Puzzle. This is a common square rotating puzzle. Click on a puzzle piece to rotate it in 4 directions. Rotate it while it fits the picture of the Submerged Atlantis. Use the "hint" button to see which pieces left to be fit. Know about Atlantis Myth and get +1 Knowledge Level. Atlantis is a fictional island mentioned within an allegory in Plato's works Timaeus and Critias. The story concludes with Atlantis falling out of favor with the deities and submerging into the Atlantic Ocean. Despite its minor importance in Plato's work, the Atlantis story has had a considerable impact on literature. The allegorical aspect of Atlantis was taken up in utopian works of several Renaissance writers. Some ancient writers viewed Atlantis as fictional or metaphorical myth; others believed it to be real. Aristotle believed that Plato, his teacher, had invented the island to teach philosophy. Aside from Plato's original account, modern interpretations regarding Atlantis are an amalgamation of diverse, speculative movements that began in the sixteenth century, when scholars began to identify Atlantis with the New World. Francisco Lopez de Gomara was the first to state that Plato was referring to America. Blavatsky was also inspired by the work of the eighteenth-century astronomer Jean-Sylvain Bailly, who had "Orientalized" the Atlantis myth in his mythical continent of Hyperborea, a reference to Greek myths featuring a Northern European region of the same name, home to a giant, godlike race. As continental drift became widely accepted during the 1960s, and the increased understanding of plate tectonics demonstrated the impossibility of a lost continent in the geologically recent past, most "Lost Continent" theories of Atlantis began to wane in popularity, but yet it remain in paintings, sculptures, music, literature and archaeology theories. Labels: Archaeology Games , Puzzles , Ancient Games , Education Games , Free Online Games.